It’s Thursday, and I promised handspun pictures for Monday. I didn’t end up getting Kris to take pictures this weekend, because we were busy setting up his new fishtank. He upgraded to a 75-gallon tank. Once it cycles and he gets some more fish in there, I’ll post pictures of that. And I know, I missed WIP Wednesday, too. So… here we are. Spanish Dancer from knitty.com, in the “Oregon Red Clover Honey” BMFA Socks That Rock that was my last YPF post. It doesn’t look like much yet, but I do think it’s going to be really pretty. Although, I’m still not looking forward to doing that ruffle (which will go where the crochet cotton is now). Oh, and the box bag in the first picture was a gift from sgeddes to each of us that rode in my car to SAFF. Isn’t she a sweetie? In other news, I’ve finished up a few things in the last week or two. 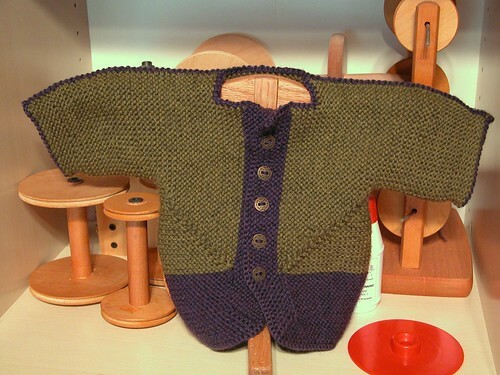 First, my very first Baby Surprise Jacket – a gift for friends of ours, whose little boy is due… well, technically yesterday. We’re waiting for the phone call at this point. That is Knit Picks Swish Superwash in Lemongrass Heather and Indigo Heather. I started it just before I went to Charlotte for SAFF, but unfortunately learned that 2 skeins of Swish is NOT enough for a BSJ. So… I ordered another skein. The Lemongrass is backordered until December, so I ordered the Indigo. I’m actually glad it worked out that way – I really like the way it looks with the two colors. I decided to go with the contrast, and did the sleeve seams and an edging on the neckline and sleeves in crochet with the Indigo. It almost looks like I planned it! 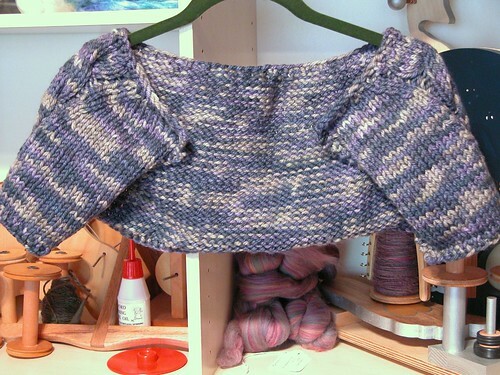 I also finished the Twilight Capelet I started after Stitches. I ran into a little issue with that one, too. I was two rows away from finishing it when I ran out of yarn. Needless to say, I was a little cranky. I debated for a bit, but I decided that I really wanted to finish it (and not rip it out and start over on a smaller hook, which was my other option), so I bit the bullet and ordered another hank of the Disco Lights. I’m glad I did. It’s really pretty. Now I just need to convince Kris to take me somewhere fun so that I can wear it. 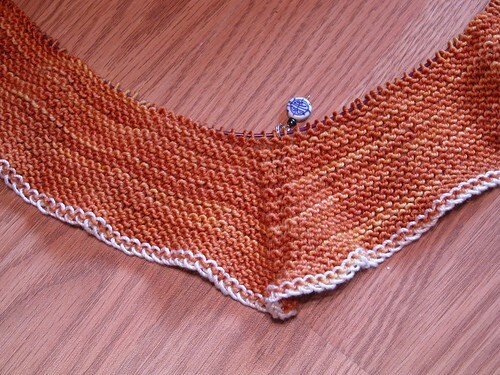 ;)My final FO for the week is Passin’ the Dress Code – a pattern I first saw on Cristi’s blog, and then on Aimee’s. When I was in Charlotte, I picked up a copy of the pattern, and two hanks of Malabrigo Chunky in “Alpine Pearl” to make it. I started it Tuesday night, finished Wednesday morning, and took a look at it. It seemed a little small, so I checked my gauge. It was off. Gah. So, I ripped the whole thing out and re-did it on larger needles yesterday afternoon. (What can I say, it’s a quick knit!) I still need to find a closure for it – I’m debating the ribbon that was used in the original – and I’m probably going to block it, but isn’t it cute? And at last – some handspun. 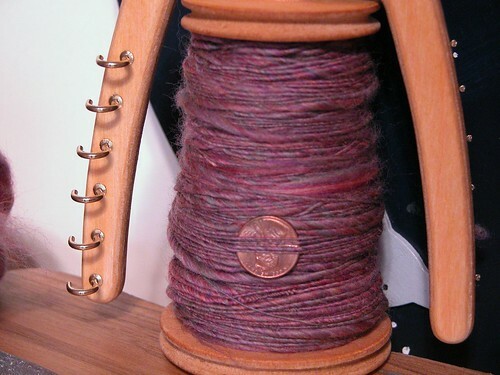 This is the first spinning I’ve actually gotten done on Zaphod. That’s most of one of two braids of Cloverleaf Farms Merino in “Rose Quartz”. I’m pretty happy with how it is coming out so far. It’s pretty even, and bordering on consistent. Yay! 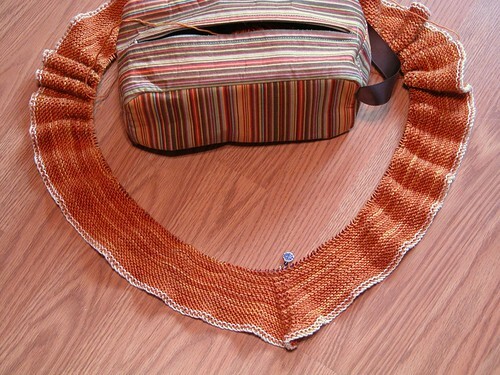 November 8th, 2007 | Tags: FOs, Knitting, SAFF, Spinning, WIPs | Category: Misc. 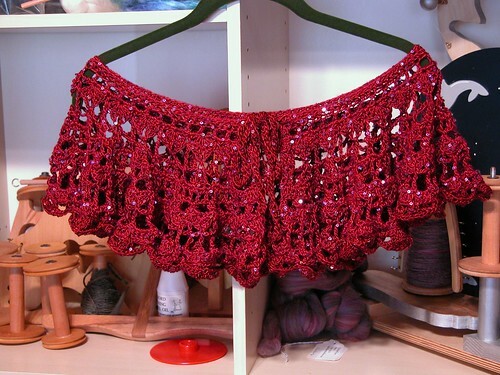 the twilight capelet looks great! I really love the color! Everything else looks great too! EVERYthing looks good, but I especially like the two-color BSJ. It does look like you planned it! Wow!! Quite a few FOs there and they all look fabulous! I love the baby surpise and the color changes are perfect! The disco capelet is going to be stunning during the holiday! It all looks great! I think that is quite a bit of work on the new shawl. Good job on the spionning! 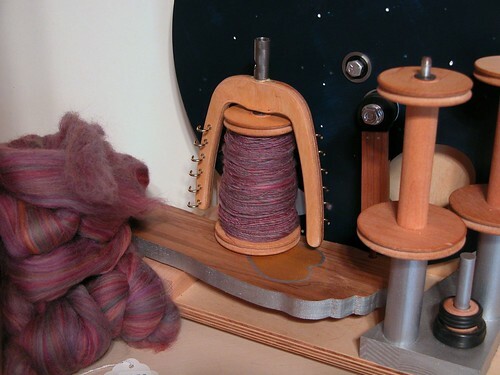 I’ve been trying my spindle out, but all I’m coming up with is thick ‘n thin. HOpefully with practive I’ll get something closer to what your doing. I’ll give you a pass since you’ve been sick, but next time, don’t horde all this goodness for 1 post! Those FOs deserve their own private shining moment! Love the capelet. Don’t know where I’d ever wear it but – pretty pretty pretty! I have a major catch up post to do too. FOs and Blogstalking and meeting Bezzie and Chunky and WIPs and MORE! I need to take another look at “Passin the dress code” too. Stop enabling me! I think that sick, traveling to SAFF and with one arm tied behind your back, you produce 10x in a week of what I can do in a month. Zaphod!! Bwahahaha…now I’m totally in the mood to read a book and I don’t have time!!! What cpurl said!! Gosh, you been BUSY, girl! Gorgeous, gorgeous, gorgeous, all of it! !